Objective To compare between two doses of ondansetron (2 mg, 4 mg) and ephedrine in prevention of maternal hypotension and bradycardia induced by spinal anesthesia, their effects on specifications of spinal blockade, neonatal outcome, and their side effects. Patients and methods One hundred twenty parturients ASA І or ІІ aged between 18 and 40 years, scheduled for elective cesarean section under spinal anesthesia. They were randomly divided into four equal groups. First group received intravenous I.V. 2 mg ondansetron, second group received I.V. 4 mg ondansetron, third group received 10 mg ephedrine, and the fourth group received normal saline. All the test drugs were administered as bolus dose five minutes before intrathecal injection. Mean blood pressure, heart rate, vasopressor use, spinal anesthesia specifications, neonatal outcome, and side effects were assessed. Results The fall in mean blood pressure after spinal anesthesia in ondansetron 4 mg group was the least and the greatest was in the control group. There was dropping in heart rate values after spinal anesthesia started from 5 minutes value with significance to the control group only. No significant difference between the four groups in the spinal anesthesia characters. Slight acidosis was noticed in the ephedrine group which doesn’t affect the clinical neonatal outcome. Conclusion Prophylactic bolus intravenous ondansetron 4 mg and to less extent 2 mg could decrease the fall in mean blood pressure of parturients following spinal anesthesia as well as intravenous ephedrine 10 mg with added advantage that it could decrease neonatal acidosis associated with ephedrine use. The advantages of spinal anesthesia such as rapidity, reliability, safety, ease of performance, and avoidance of the hazards of general anesthesia make it the gold-standard anesthetic technique for elective cesarean delivery . Its use has a major limitation, which is development of hypotension and bradycardia, with a subsequent decrease in uteroplacental blood flow, which leads to fetal acidosis and increase in fetal morbidity and mortality . Spinal anesthesia induces sympathetic block that leads to vasodilatation, pooling of venous blood, decrease of venous return, and low ventricular volume state, which leads to activation of chemoreceptors and mechanoreceptors in the cardiac wall with abrupt withdrawal of sympathetic supply, and unopposed vagal tone to the heart, which leads to bradycardia and hypotension; this reflex is called the Bezold–Jarisch reflex (BJR)  and it is triggered by serotonin (5-HT3) released from thrombocytes under low ventricular volume conditions that stimulate cardiac chemoreceptors and increase the vagal tone . Serotonin (5-HT3) antagonists are suggested to be used in the prevention of hypotension and bradycardia caused by BJR in response to spinal anesthesia . Onandsetron is a 5-HT3 antagonist that has been used to prevent nausea and vomiting caused by chemotherapy, radiotherapy, and surgery  and there are clinical trials for its use in the prevention of BJR after spinal anesthesia in obstetric patients . Serotonin (5-HT3) receptors are present in the spinal cord and it was found that the 5-HT3 level increased in the cerebrospinal fluid after spinal anesthesia with bupivacaine ; thus, there was a query about the effects of the 5-HT3 antagonist onandsetron on the specifications of spinal anesthesia . Ephedrine is a noncatecholamine sympathomimetic that has α and β adrenergic activity, and it is the classical vasopressor of choice for the treatment of postspinal hypotension in cesarean delivery, but it can induce maternal cardiovascular adverse effects such as supraventricular tachycardia, tachyphylaxis, and fetal acidosis . This study hypothesizes that onandsetron as well as ephedrine have the ability to prevent postspinal hypotension and can avoid the side effects of ephedrine. The aim of this study was to compare two doses of ondansetron (2 and 4 mg) and ephedrine in the prevention of maternal bradycardia and hypotension induced by spinal anesthesia (primary outcome), specifications of spinal blockade, neonatal outcome, and side effects (secondary outcomes). This prospective, randomized, double-blinded, clinical trial was conducted in El-Minia University Hospital in the period from April 2015 to November 2015. Written informed consent was obtained from every parturient included in the study. Ethical approval for this study was provided by the Ethics Committee of El-Minia, Faculty of Medicine. Parturients scheduled for elective cesarean delivery under spinal anesthesia, ranging in age from 18 to 40 years with a single viable fetus at full term, and American Society of Anesthesiologists physical status I or II were included. Parturients with contraindication to spinal anesthesia (infection, vertebral column deformity, or coagulopathy) or those who refused to participate, those with morbid obesity, pregnancy-induced hypertension, parturients with high-risk pregnancy, parturients on treatment with selective serotonin reuptake inhibitors or on migraine therapy, and those with known hypersensitivity to the test drugs were excluded from the study. Totally, 120 parturients eligible for the study were allocated randomly to the four equal groups of 30 parturients each using random allocation software (Windows software, IL, Chicago, USA, version 1.0, May 2004). The allocation ratio was 1 : 1, and the group identification paper was placed in a sealed and opaque envelop to conceal allocation. Parturients had to be fasting for 6 h before the operation. In the operating room, ECG, noninvasive blood pressure, and pulse oximetry (SpO2) were connected to the parturients to record heart rate (HR), mean blood pressure (MBP), and oxygen saturation. A peripheral 18-G intravenous (i.v.) cannula was inserted into the dorsum of the nondominant hand and a preload of 5 ml/kg of warm normal saline 0.9% was administered. The test drugs were diluted in a 10 ml syringe of saline by another anesthesiologist not included in the study and labeled as A, B, C, and D. The test drugs were injected slowly i.v. 5 min before performance of the spinal block. At the end of the study, the following groups were established: group A received 2 mg of ondansetron, group B received 4 mg of onandsetron, group C received 10 mg of ephedrine, and group D received normal saline only. While the parturients were in sitting position and under complete aseptic conditions, spinal anesthesia was performed at L3–L4 using a 25-G Quincke spinal needle (Typo Healthcare, Gasport, UK). Volume of 10 mg of hyperbaric bupivacaine 0.5% (Marcaine; AstraZeneca, Södertälje, Sweden) plus 15 μg fentanyl was injected. Time of complete intrathecal injection was considered as 0 time. Parturients lay in a supine position with a 15° left tilt and supplemental oxygen was administered through a nasal cannula at 4 l/min. Parturients received warm normal saline 0.9% at a rate of 10 ml/kg/h. MBP, HR, and oxygen saturation (SpO2) were recorded at the baseline before spinal anesthesia and then every 5 min until the end of the surgery. Hypotension was defined as a decrease in the MBP of more than 20% of the baseline value and it was treated by an i.v. bolus dose of 50 μg phenylepherine repeated as needed; the total dose of phenylepherine was recorded. Bradycardia was defined as HR below 60 beat/min and it was treated by a 0.5 mg i.v. bolus dose of atropine, followed by incremental doses of 0.1 mg as required. Vomiting was treated by 10 mg i.v. bolus dose of metclopromide. Sensory block was examined by loss of sensation to pin prick at midclavicular line every 2 min until fixation of the sensory level in two consecutive times. The surgeon was allowed to start surgery when the sensory block level was established at T6. Time to reach the highest sensory level from the injection time of bupivacaine into the subarachnoid space was recorded. Parturients who failed to reach this level were excluded from the study. The Bromage scale (1–free movement of legs and feet; 2–unable to flex the hip, able to move the knee, ankle, and toes; 3–unable to move the hip and knee, able to move the ankle and toes; 4–unable to move the hip, knee, ankle, and toes) was used . After delivery of the baby, parturients received a bolus dose of 5 IU of oxytocin, followed by an infusion of 40 IU. A blood sample of the umbilical vein and the umbilical artery (UA) from a double-clamped segment was obtained immediately after cord clamping and analyzed for pH and blood gases. Maternal complications such as bradycardia, hypotension, rebound hypertension nausea, vomiting, and shivering were recorded. Neonatal complications such as respiratory depression and neonatal acidosis were also recorded. Assessment of the neonates was performed using the Apgar score at 1 and 5 min. In a previous study of Sahoo et al. , it was found that the mean arterial blood pressure in the control group was 82.2±10.5 mmHg. It was estimated that the least number of parturients required for the study to detect a 10% decrease in MBP was 26 parturients to achieve an α error of 5% and a power of 80% with a 10% dropout rate; the number was increased to 30 parturients in each group. This study used statistical program statistical package for the social sciences (SPSS; SPSS Inc., Chicago, Illinois, USA) version 20 for entry and analysis of the data. Data were examined for normal distribution using the Kolmogorov–Smirnov test. Quantitative data were presented as mean±SD. Categorical data were presented as percentage and number. An independent t-test was used for comparison with the baseline value in each group. The analysis of variance test was used for comparison between the mean of the groups. χ2-Test and Fisher’s exact test were used for comparison of categorical data. All tests were two-sided. A P value less than 0.05 considered statistically significant. One hundred and twenty parturients were eligible for this study; all of them continued the study to statistical analysis ([Figure 1]). There was no significant difference between the four groups in parturients̓ demographic data and duration of surgery ([Table 1]). In terms of the changes in the mean arterial blood pressure, there was no significant difference between the four groups in the baseline values. There was a significant decrease in the blood pressure 5 min after spinal block compared with the baseline value in the four groups, with the least decrease in the onandsetron 4 mg group and the highest decrease in the control group. There was a significant difference between the three test groups and the control group at all study time points started from the 5 min reading. There was no significant difference between the two onandsetron groups and the ephedrine group at all the study time points ([Table 2]). There was no significant difference between the four groups in HR in the baseline values. There was a decrease in the HR values in the four groups in comparison with the baseline values that became significant in the ephedrine and control groups at 5, 10, and 15 min. HR values were the highest in the onandsetron 4 mg group and the lowest in the ephedrine group, with a significant difference between the two groups of onandsetron (2 and 4 mg) and ephedrine, and the control groups at 5, 10, and 15 min ([Table 3]). There was no significant difference between the four groups in the characteristics of the spinal block (time to upper sensory block, time to two-segment regression, time to complete motor block, and time to complete recovery) ([Table 4]). In terms of the condition of the neonates, Apgar score values in the control group were lower than those of the other three groups and this difference was significant at 1 min, whereas there was no significant difference between the other three groups. There was no significant difference between the four groups in the Apgar score at 5 min. In terms of pH values, there was no significant difference between the four groups, with the least values observed in the ephedrine group ([Table 5]). In terms of side effects, none of the parturients complained of nausea in the onandsetron 2 and 4 mg groups, whereas five (16.6%) and 20 (66.6%) parturients in the ephedrine and control groups, respectively, complained of nausea. None of the parturients developed bradycardia in the onandsetron group, whereas five (15.6%) and seven (23.3%) parturients in the ephedrine and control groups, respectively, developed bradycardia. Incidence of shivering was higher in the control group (50%) in comparison with the other groups; where it was 26.6% in the ephedrine group, 20% in the onandsetron 2 mg group, and 13.3% in the onandsetron 4 mg group ([Table 6]). Cesarean delivery is usually performed with spinal anesthesia to avoid the risks of general anesthesia, but it is frequently followed by hypotension that may be harmful to both the mother and the baby . Several techniques to decrease the incidence and severity of maternal hypotension that usually follows spinal anesthesia include preloading with fluids, and left lateral tilt to prevent the gravid uterus from compression on the inferior vena cava, with a subsequent decrease in the venous return . This study found that prophylactic bolus i.v. Onandsetron (2 or 4 mg) could prevent maternal hypotension after spinal anesthesia in cesarean delivery as well as ephedrine without any effect on motor and sensory block, with the added benefit that it improved neonatal acidosis that is observed with ephedrine use. In agreement with the results of this study, Sahooo et al. , in their study on 52 parturients scheduled for elective cesarean delivery under spinal anesthesia and parturients who were treated with 4 mg onandsetron as a prophylaxis against hypotension, found that onandsetron reduced the incidence and severity of postspinal hypotension and decreased the requirement of vasopressor use. Owczuk et al. studied 72 parturients scheduled for cesarean delivery with spinal anesthesia by 4 ml of 0.5% bupivacaine and the parturients were treated with 8 mg of onandsetron as a prophylaxis for postspinal hypotension and they found that 8 mg onandsetron could attenuate the decrease of systolic and MBP only, but it had no influence on the decrease in diastolic blood pressure or HR after spinal anesthesia, which could be explained by the high dose of intrathecal bupivacaine (20 mg) used in their study. Gao et al. , in their meta-analysis study of 10 randomized-controlled trials conducted on 863 patients, found that prophylactic onandestron reduced the incidence of spinal anesthesia-induced hypotension and vasopressor consumption in obstetric patients and reduced side effects as nausea, vomiting, and shivering. Marashi et al. compared prophylactic i.v. onandsetron 6 and 12 mg and placebo in the attenuation of postspinal hypotension and bradycardia, and they concluded that pretreatment with either 6 or 12 mg i.v. onandsetron could reduce hemodynamic changes following spinal anesthesia without significant differences between the two doses of onandsetron. Wang et al. studied 66 parturients scheduled for elective cesarean section under spinal anesthesia, and found that prophylactic administration of 4 mg onandsetron 5 min before spinal anesthesia with crystalloid preloading was effective in the prevention of maternal hypotension, decreased vasopressor requirements, and improved acid–base status of the neonates. Trabelsi et al. studied 80 parturients scheduled for cesarean delivery under spinal anesthesia with 10 mg bupivacaine plus 2.5 μg suefentanil after preloading with 10 ml/kg saline; half of them received 4 mg onandsetron 5 min before spinal anesthesia and it was found that onandsetron could protect the parturients against hypotension and bradycardia and could also improve metabolic (neonatal pH) and clinical parameters (Apgar score) of the newborns. They suggested that onandsetron has a dual action: on the heart, improving contractility, and on blood vessels, maintaining vascular resistance. Wang et al. studied 150 parturients scheduled for cesarean delivery with spinal anesthesia; they were divided into five groups of 30 parturients each according to the dose of prophylactic onandsetron, 2, 4.6, and 8 mg, and placebo. They concluded that onansetron was effective in the prevention of postspinal hypotension, and could improve neonatal pH and clinical condition; also, they concluded that the best dose of onandsetron for this purpose was 4 mg. In contrast, Ortiz-Gómez et al. , in their postoperative randomized placebo-controlled trial on 128 pregnant women scheduled for elective cesarean delivery with spinal anesthesia, found that prophylactic 2, 4, 8 mg of onandsetron played no role in the prevention of postspinal hypotension or in reducing vasopressor consumption; this difference may be related to the dose of intrathecal bupivacaine that was individualized in each parturient to be 9.7±0.4 mg in the placebo group and 9.6±0.3 mg in the onandsetron group, which was smaller than that used in this study. This study estimated the dose of ephedrine from previous researches that studied the effect of different doses of ephedrine on the prevention of hypotension that developed after spinal anesthesia. Loughrey et al. compared two doses of prophylactic ephedrine (6 and 12 mg) and placebo in 68 parturients scheduled for cesarean delivery under spinal anesthesia and found that the higher dose (12 mg) of ephedrine was associated with less incidence of hypotension. Magalhães et al. compared prophylactic i.v. 10 mg ephedrine and 80 μg phenylepherine and found that 10 mg of ephedrine would be efficient prophylaxis for postspinal hypotension in parturients with slight neonatal acidosis, but without serious clinical effects on the neonatal condition as shown by the Apgar score, and suggested that the lower pH values in the ephedrine group were linked to the increased fetal metabolism by the β-adrenergic activity of ephedrine. Gunda et al. studied 100 parturients scheduled for cesarean section under spinal anesthesia and found that a prophylactic i.v. bolus dose of 5 mg ephedrine was efficient in the prevention of postspinal hypotension and the neonatal outcome was satisfactory as shown by the Apgar score at 1 and 5 min. In terms of the condition of the neonates, this study found that there was a significant difference in the Apgar score at 1 min between the onandsetron and ephedrine groups and the control group, but this significant difference disappeared at the 5 min measurement. There was no significant difference between the ephedrine group and both of the ondansetron group. In the umbilical cord blood gas analysis, it was found that the pH value in the ephedrine group was lower than that of the onandsetron and control groups. It is better to use the Apgar score than umbilical cord blood gas analysis for the prediction of the neonates’ condition as it is more reliable as recommended by Allen et al. .
Moslemi Rasooli  compared prophylactic ephedrine and phenylephrine on 83 parturients scheduled for cesarean delivery under spinal anesthesia and found decreased neonatal pH and increased incidence of vomiting, but without significance, in the ephedrine group. Cooper et al. compared phenylephrine 100 μg/ml and ephedrine 3 mg/ml or their combination in the prevention of postspinal hypotension in cesarean delivery and they found that both groups could maintain the MBP, but the ephedrine group showed increased incidence of neonatal acidosis, nausea, and vomiting. They attributed the high incidence of neonatal acidosis in the ephedrine group to the β-adrenergic activity of ephedrine, which increases fetal metabolism and anaerobic glycolysis. Also, they found that the incidence of nausea and vomiting was increased in the ephedrine group, although blood pressure was maintained after spinal anesthesia. Ngan Kee et al. , in their randomized double-blinded comparison of phenylepherine and ephedrine infusion combinations to maintain blood pressure during spinal anesthesia for cesarean delivery, found that neonatal pH and PO2 decreased with increased percentage of ephedrine in the combination and they attributed this to the fetal metabolic stimulation caused by the β-adrenergic action of ephedrine, which was consistent with the increased UA PCO2 and decreased UA oxygen content without a corresponding decrease in umbilical vein measurements. In terms of the effect of onandsetron on the characteristics of spinal anesthesia, this study found that i.v. onandsetron had no effect on the onset, duration, and the level of sensory, and motor block of spinal anesthesia, although it was assumed that onandsetron, which is a 5-HT3 antagonist, would affect the onset, duration, and intensity of spinal anesthesia as the serotonin (5-HT3) level in cerebrospinal fluid increased after spinal anesthesia . This is in agreement with the study of Samra et al. , who evaluated the effects of systemic 4 mg onandsetron on the characteristics of spinal anesthesia in urinary bladder tumors, and concluded that it had no effects on the intensity or the duration of motor or sensory block; this difference could be attributed to the action of onandsetron on other receptors such as adrenergic, histaminic, dopaminergic, and opioid receptors. This study had two limitations: first, cardiac output and systemic vascular resistance should have been measured to evaluate the effects of onandsetron on cardiac contractility, but these measurements require invasive hemodynamic monitoring such as a Swan–Ganz catheter or tansesophageal echo, which was difficult in conscious female patients. The second limitation was that colored Doppler should have been used for UA and vein after spinal anesthesia to estimate uteroplacental blood flow to identify the relation of fetal acidosis, maternal hypotension, and uteroplacental blood flow and ephedrine use, but this would take a long period of time after anesthesia affecting fetal well being and pH. Prophylactic bolus i.v. onandsetron 4 mg and to a lesser extent 2 mg could decrease the fall in the MBP of parturients following spinal anesthesia as well as ephedrine 10 mg, with the added advantage that they could decrease neonatal acidosis associated with ephedrine use. Cyna AM, Andrew M, Emmett RS, Middleton P, Simmons SW. Techniques for preventing hypotension during spinal anaesthesia for caesarean section. Cochrane Database Syst Rev 2006; CD002251. Mebazaa MS, Ouerghi S, Ben Meftah R, Ben Cheikh M, Mestiri T, Ben Ammar MS. Reduction of bupivacaine dose in spinal anaesthesia for caesarean section may improve maternal satisfaction by reducing incidence of low blood pressure episodes. Middle East J Anaesthesiol 2010; 20:673–678. Liu SS, McDonald SB. Current issues in spinal anesthesia. Anesthesiology 2001; 94:888–906. Nallam SR, Dara S. Effect of intravenous ondansetron on reducing the incidence of hypotension and bradycardia events during shoulder arthroscopy in sitting position under interscalene brachial plexus block: a prospective randomized trial. Indian J Anaesth 2015; 59:353–358. Mathew D, Phillip L, Joseph P, Tyler WI. Onandsetron given intravenously to attenuate hypotension and bradycardia during spinal anesthesia in cesarean delivery: a literature review. Oakland City: Oakland University; 2012. 4–10. Available at: https://Oaklandcrna.files.Wordpress.com/2012/05/zofran-4-10-ama.pdf. Christofaki M, Papaioannou A. Ondansetron: a review of pharmacokinetics and clinical experience in postoperative nausea and vomiting. Expert Opin Drug Metab Toxicol 2014; 10:437–444. Wang Q, Zhuo L, Shen MK, Yu YY, Yu JJ, Wang M. Ondansetron preloading with crystalloid infusion reduces maternal hypotension during cesarean delivery. Am J Perinatol 2014; 31:913–922. Naesh O, Hindberg I, Christiansen C. Subarachnoid bupivacaine increases human cerebrospinal fluid concentration of serotonin. Reg Anesth 1996; 21:446–450. Fassoulaki A, Melemeni A, Zotou M, Sarantopoulos C. Systemic ondansetron antagonizes the sensory block produced by intrathecal lidocaine. Anesth Analg 2005; 100:1817–1821. Kansal A, Mohta M, Sethi AK, Tyagi A, Kumar P. Randomized trial of intravenous infusion of ephedrine or mephentermine for management of hypotension during spinal anaesthesia for caesarean section. Anaesthesia 2005; 60:28–34. Bromage PR. Epidural analgesia. Philadelphia: WB Saundersted; 1978. Owczuk R, Wenski W, Polak-Krzeminska A, Twardowski P, Arszułowicz R, Dylczyk-Sommer A et al. Ondansetron given intravenously attenuates arterial blood pressure drop due to spinal anesthesia: a double-blind, placebo-controlled study. Reg Anesth Pain Med 2008; 33:332–339. Gao L, Zheng G, Han J, Wang Y, Zheng J. Effects of prophylactic onandsetron on spinal anesthesia-induced hypotension: a meta-analysis. Int J Obstet Anesth 2015; 24:335–343. Trabelsi W, Romdhani C, Elaskri H, Sammoud W, Bensalah M, Labbene I, Ferjani M. Effect of ondansetron on the occurrence of hypotension and on neonatal parameters during spinal anesthesia for elective caesarean section: a prospective, randomized, controlled, double-blind study. Anesthesiol Res Pract 2015; 2015:158061. Wang M, Zhuo L, Wang Q, Shen MK, Yu YY, Yu JJ, Wang ZP. Efficacy of prophylactic intravenous ondansetron on the prevention of hypotension during cesarean delivery: a dose-dependent study Int J Clin Exp Med 2014; 7:5210–5216. Ortiz-Gómez JR, Palacio-Abizanda FJ, Morillas-Ramirez F, Fornet-Ruiz I, Lorenzo-Jiménez A, Bermejo-Albares ML. 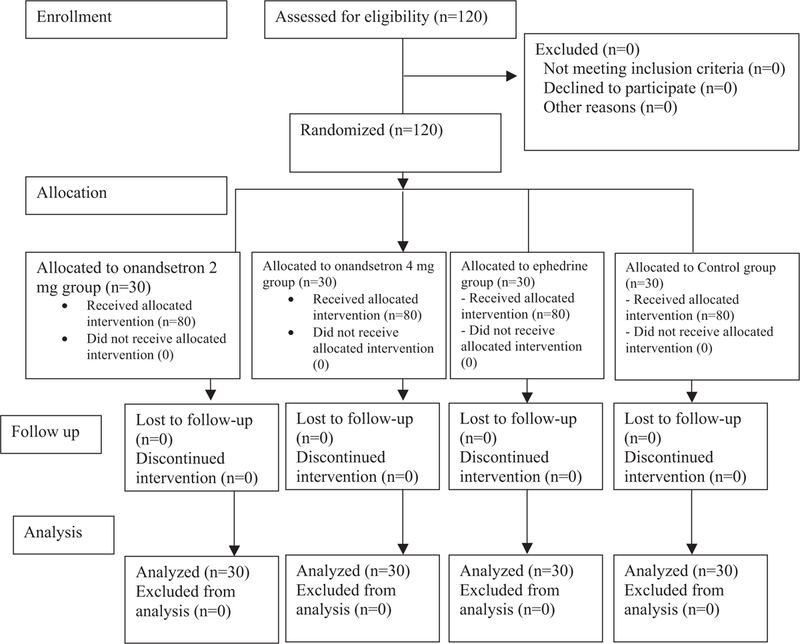 The effect of intravenous ondansetron on maternal haemodynamics during elective caesarean delivery under spinal anaesthesia: a double-blind, randomised, placebo-controlled trial. Int J Obstet Anesth 2014; 23:138–143. Loughrey JP, Walsh F, Gardiner J. Prophylactic intravenous bolus ephedrine for elective caesarean section under spinal anaesthesia. Eur J Anaesthesiol 2002; 19:63–68. Magalhães E, Govêia CS, de Araújo Ladeira LC, Nascimento BG, Kluthcouski SM. Ephedrine versus phenylephrine: prevention of hypotension during spinal block for cesarean section and effects on the fetus. Rev Bras Anestesiol 2009; 59:11–20. Gunda CP, Malinowski J, Tegginmath A, Suryanarayana VG, Chandra SB. Vasopressor choice for hypotension in elective cesarean section: ephedrine or phenylephrine? Arch Med Sci 2010; 6:257–263. Allen TK, George RB, White WD, Muir HA, Habib AS. A double-blind, placebo-controlled trial of four fixed rate infusion regimens of phenylephrine for hemodynamic support during spinal anesthesia for cesarean delivery. Anesth Analg 2010; 111:1221–1229. Moslemi F, Rasooli S. Comparison of prophylactic infusion of phenylephrine with ephedrine for prevention of hypotension in elective cesarean section under spinal anesthesia: a randomized clinical trial. Iran J Med Sci 2015; 40:19–26. Cooper DW, Carpenter M, Mowbray P, Desira WR, Ryall DM, Kokri MS. Fetal and maternal effects of phenylephrine and ephedrine during spinal anesthesia for cesarean delivery. Anesthesiology 2002; 97:1582–1590. Ngan Kee WD, Lee A, Khaw KS, Ng FF, Karmakar MK, Gin T. A randomized double-blinded comparison of phenylephrine and ephedrine infusion combinations to maintain blood pressure during spinal anesthesia for cesarean delivery: the effects on fetal acid-base status and hemodynamic control. Anesth Analg 2008; 107:1295–1302. Samra T, Bala I, Chopra K, Podder S. Effect of intravenous ondansetron on sensory and motor block after spinal anaesthesia with hyperbaric bupivacaine. Anaesth Intensive Care 2011; 39:65–68.